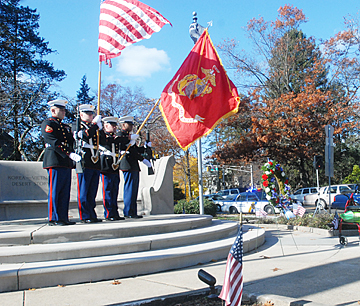 FLAGS HELD HIGH ON VETERANS DAY: November 11 was celebrated Tuesday morning at the All Wars Monument. Sponsored by the Spirit of Princeton Committee, the ceremony included a color guard and rifle detail from the Marine Corps Reserve Training Center in West Trenton. The featured speaker was Benjamin Cittadino, a local attorney and former Naval officer who served three years at sea on a mine sweeper. His father was Commanding Officer of a sub chaser during World War II; his son is a fighter pilot on the USS Theodore Roosevelt in support of the U.S. and coalition forces in Afghanistan. A joint meeting of the Township Committee and the Borough Council to vote on a library parking agreement Monday evening became contentious as members of both groups challenged the others priorities about other issues and debated the way in which the question of money owed by the Township to the Borough should be resolved. Princeton Future met last Saturday to discuss housing, transportation and mobility, and the future of the downtown. Guiding themes included how new structures and consolidation of resources might help Princeton. The Solley Theater at the Paul Robeson Center for the Arts was packed for the preview screening of Princeton playwright-turned-director Charles Evered’s Adopt A Sailor on Monday. “It means a lot for me to show this movie here because it is my hometown,” Mr. Evered said while introducing the work. Lori Heningers last official day at work, December 31, marks a tenure of a little over two years at the helm of HiTOPS, the 22-year-old non-profit organization that seeks to promote adolescent health and well-being. About 150 people attended the fourth annual Princeton Research Symposium (PRS) at the Friend Center last Saturday, marking a record number for the four-year-old event where Princeton graduate students and research staff discuss their current work, through poster presentations and talks, with the University community and the general public. The banners recently hung in the rafters of Jadwin Gym serve as a daily reminder to the Princeton University mens basketball players of the glory that has preceded them. Heading into early October, the Princeton High boys soccer team was sailing along, brimming with confidence. Courtney Banghart has proven herself to be a quick study.